I. Joe. The name was taken from the movie The Story of G.I. Joe. Then two years later, Hasbro began featuring members from all branches of the armed forces. The name, G.I. 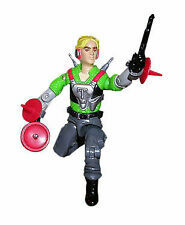 Joe, no longer referred to one specific character but as the brand for the entire toyline. 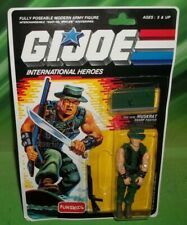 Hasbro toy company's first "action figure" was introduced with the name of G.I. Joe. They were 12" tall. 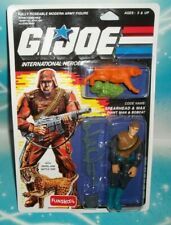 The toyline was dedicated to one character named G.I. Joe. Later on, the line featured members from America's Armed Forces and some foreign soldiers as well. This was the years of the Adventure Team and the Kung Fu grip. It was also the period where there is a departure from its traditional military settings and began wading in to more fantastic concepts such as the introduction of the Intruders, alien invaders who are the Adventure Team's arch nemesis. With rising oil prices in 1977, a cost-saving measure of "shrinking" G.I. Joe to 8 inches was implemented with the name of Super Joe. The Super Joe series had the characters turned into superheroes. Finally in 1978, G.I. Joe was discontinued for the same reason Super Joe was introduced, the rising cost of petroleum. After a few years of absence from the toy shelves and with the help of the Star Wars 3.75" figure successes, G.I. Joe was re-introduced in a 3.75" format. This toy series lasted through 1994, producing over 500 figures and 250 vehicles and playsets. Cobra was the main enemy force during this toy lines run. Each toy figure included a character bio, called a "File_card." During the 12 year production, there were many "subsets" produced. There was also two series of cartoons, "Sunbow", and "DIC" produced with this toyline. There was also a Marvel Comic series that featured many of the toy characterizations. G.I. Joe: A Real American Hero was renamed for the European market. 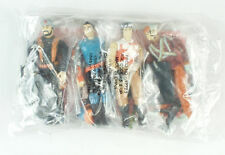 The toyline and the accompanying television show and comics were renamed Action Force, presumably to make the toyline appear more international and less American-centric. Sgt. Savage and his Screaming Eagles were put on the toy shelves in a 4" size, World War II-based theme. This was the only year Sgt. Savage and his Screaming Eagles were produced. The series was not labeled G.I. Joe but it contains its themes. The enemy force was the Iron Army, cybernetically-enhanced WWII style criminals and robots. There was one cartoon featuring Sgt. Savage. 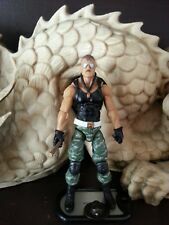 G.I.Joe Extreme was introduced in a 5" tall, limited articulation format. These figures, as well as vehicles, took on a future premise storyline that had the Extreme team battling SKAR. Sgt. Savage is a part of this series. 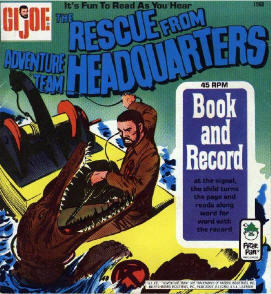 Dark Horse Comics produced the G.I. Joe Extreme comic. There was also a cartoon series that supported the toyline. Toys R Us began carrying a store-exclusive line that featured "re-produced" figures and vehicles from the G.I. Joe: A Real American Hero line. Some original 1982-1994 3.75 inch line toys were "re-produced" in "collector edition" 2-packs, along with vehicles. In 2001, the Devil's Due publishing company bought the rights to produce new comics that continued the storyline from Marvel Comics. The comic series was helpful in bringing back G.I. Joe's popularity. 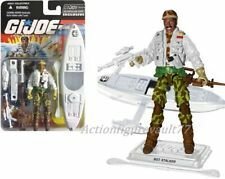 The basic 3.75" sized GI Joe toy sculpture style was changed in 2001 with the introduction of yearly themes. Each year's 3.75" series had a slight change in figure production construction. In 2002, the theme was "G.I. Joe vs. Cobra" and featured new style figures that had "T-crotches" with no "O-ring." 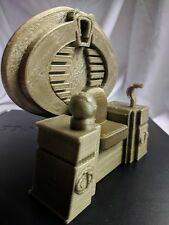 New characters were introduced in that period and new molds for both old and new. 2003 was themed "Spytroops" and had many figures produced with "O-rings" again. There was a direct-to-video "Spytroops" CGI movie. 2004 featured the "Valor vs. Venom" theme up until the first half of 2005. "Valor vs. Venom" also had a OVA CGI movie. The 3.75" sized figures were removed from toy shop shelves early in 2005, and sold exclusively through online retailers and through a new Hasbro online store, Hasbro Toy Shop. These figures were designed with the adult collector in mind, and while retaining the sculpting style of the 2002-2005 "themed years," produced toy characters from the "original 1982-1994" G.I. Joe series, as well as new toy characters. In the fall of 2005, Hasbro re-introduced G.I. 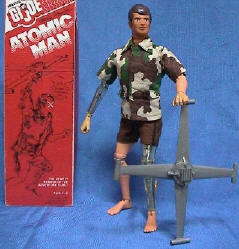 Joe on the toy shelves with 8"-sized action figures, G.I. Joe: Sigma 6. The comic is produced and published by Devil's Due Publishing and there is also a cartoon series airing on FOX and produced by GONZO. Prices current as of last update, 04/13/19 3:44am.